Company Parties * And More! The Dowd' Country Inn offers catering and event services for parties of all sizes. Beyond our 80 seat tavern, our building hosts a 40 seat dining room, 200 seat banquet hall, and an outdoor courtyard and patio. The Dowds' Country Inn hosts events of all kinds, including Banquets, Wedding Ceremonies and Receptions, Cocktail Parties, Meetings and Retreats, Company Parties, and more! For more information about planning an event with us, as well as for menus & pricing, fill out our Event Inquiry Form or call us at 603.795.4712. Visit our Gallery for a collection of images from past events. The Dowds' Country Inn has been hosting weddings for over 25 years. 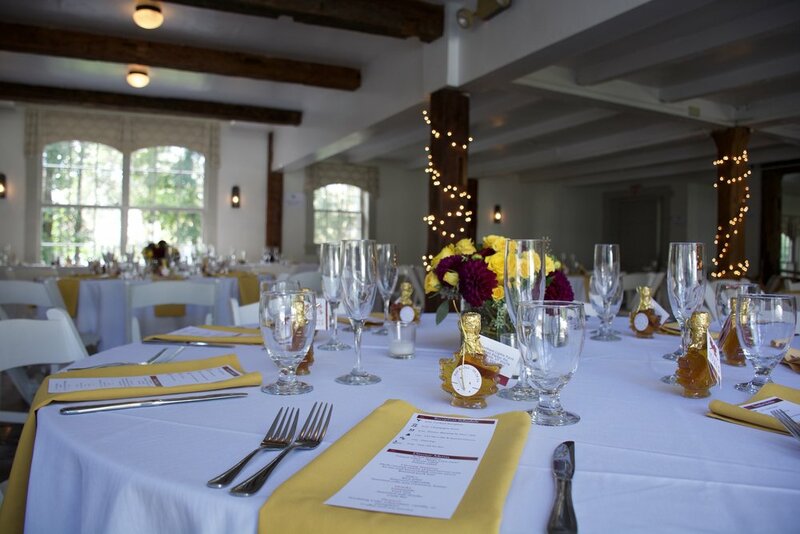 With its classic New England architecture, carefully restored banquet room, floral and vegetable gardens, courtyard & patio, the Inn is the perfect location for any ceremony or reception. It is the Upper Valley's premier event center, a country inn gem only minutes from Hanover, New Hampshire. We take pride in helping couples book the event of their dreams. Looking for a location to host a celebration or family event? We can host a variety of special events, such as Family Reunions, Bridal & Baby Showers, Class Reunions, Anniversaries, Memorial Gatherings, Birthday Parties, Bar Mitzvahs, Bat Mitzvahs & more. The Dowds' Country Inn is the perfect place to hold your next corporate event. We have the capacity to host Sales Meetings, Corporate Retreats, Conferences, Award Banquets, Holiday Parties, Retirement Parties & more. We host 20 guest rooms to accommodate your guests, and full catering services to provide your event with food for breakfast, lunch & dinner. We also have the A/V equipment to suit your needs. The Dowds' Country Inn provides full catering & bar services for events hosted on site. Our experienced team strive to provide the best quality food & beverage for your special event. Contact us today for our full menu & beverage packages. Contact us about planning your next event! Click here to learn more about our Event Spaces.